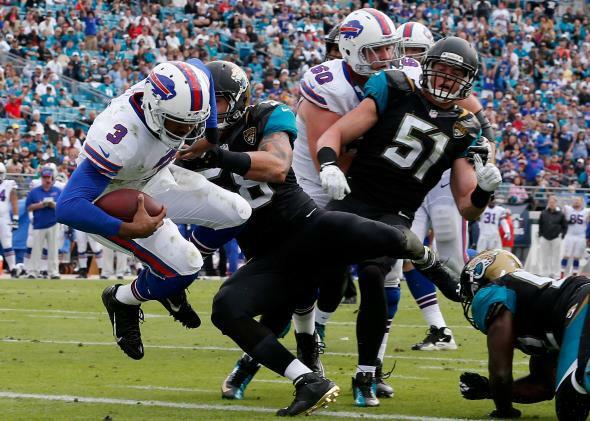 First NFL live-stream: Yahoo to show Bills-Jaguars for free worldwide. Yahoo is rumored to have outbid other tech companies, including Google, for the right to the NFL’s first regular-season live-stream. For the first time, the NFL has reached a deal to live-stream a regular-season game, for free, to a worldwide audience. Score one for the cord-cutters. Now the bad news: It’s the Bills vs. the Jaguars. In London. At 9:30 a.m. Eastern. It’s hard to imagine a less appealing matchup than this midseason clash between nondivisional nonrivals from small markets who haven’t made the playoffs in years. And yet Yahoo paid at least $10 million for the rights, according to an anonymous source in a CNN Money report. (Re/Code’s Peter Kafka hears at least $20 million.) Yahoo will make the game available on both the Web and mobile devices, with no login or cable subscription required. Google and several other companies were reportedly involved in the bidding. The obstacle is that TV networks pay huge sums for exclusive broadcast rights. The value of those telecasts would be diminished if viewers had the choice to watch out-of-market games for free online. No wonder the NFL started with an “experimental” online broadcast of a game the networks probably weren’t clamoring for anyway. One other obstacle: live-streams of big games are often really bad. Even so, this is a milestone in the history of televised sports, which have largely been off limits to cord-cutters. And it’s a big deal for Yahoo, which has always been as much a media company as a tech company. Even if it loses money on the game itself, the move will draw viewer and advertiser attention to its online video offerings, which the company sees as a key to its future. I’m a little surprised Google didn’t outbid Yahoo simply as a defensive maneuver: YouTube’s dominance in online video is looking less secure all the time.